Arnstein Building, 505 Market St.
3 3 Michael Brady Inc. The Press Room, Loch & Key Productions, Loghaven Gateway, Elst Brewing Co.
Cherokee Mills, 111 N. Concord St.
K-25 History Museum, Y-12 UPF Fabrication Warehouse, River & Rail Theater, Cor Jesu Monastery, UTK Vet School Improvements Phase 2 & 3, Sequel Norris Academy for Autistic Children, ORNL Historic Window Replacements, Knox County Schools Security Vestibules, K-Brew Coffee, Junaluska History Museum, Oak Ridge Fire Station #4 Renovation. Source: Individual company representatives, individual company websites. NA=not applicable or not available. 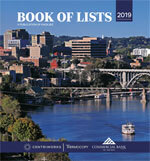 This list and other Knoxville-area market data are available as Excel spreadsheets at www.knoxvillebookoflists.com. If you notice an error or omission, please contact Hayley Choy at 865-342-6494 or lists@knoxvillebiz.com.